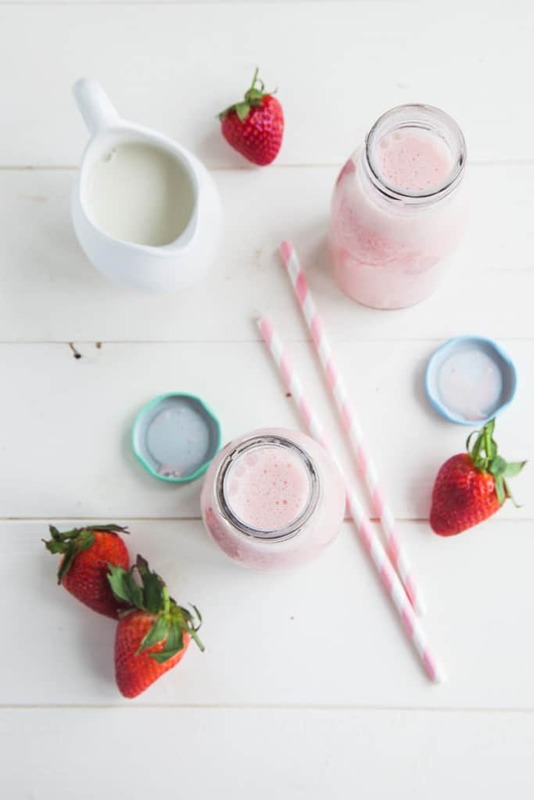 I’m going crazy for strawberries lately and after coming across these adorable retro-style milk bottles, I was inspired to create this Strawberries & Cream smoothie which I was half-tempted to call a Strawberry Milkshake Smoothie because it tastes just like a strawberry milkshake, especially when it’s served in these bottles! As my regular readers will already know, all my smoothies are banana-free due to allergies. So if you too suffer from an intolerance to bananas or simply don’t like them, then all my smoothies are safe to try! 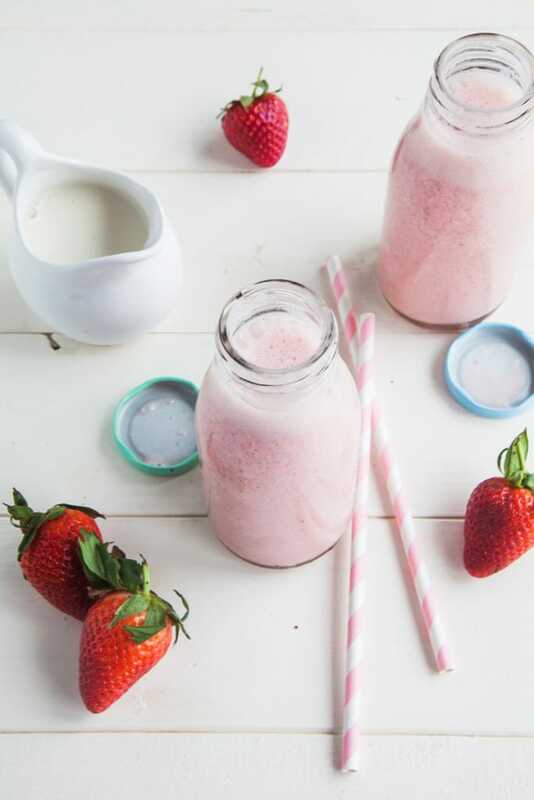 This smoothie is made with dairy-free yoghurt which gives it a thick, creaminess. If you’re wanting to keep this smoothie low-fat, I suggest using soy yoghurt but other yoghurts will taste wonderful too, I’m sure. Kids will absolutely love this smoothie as a healthy alternative to strawberry milkshake and it makes a pretty healthy breakfast option too! 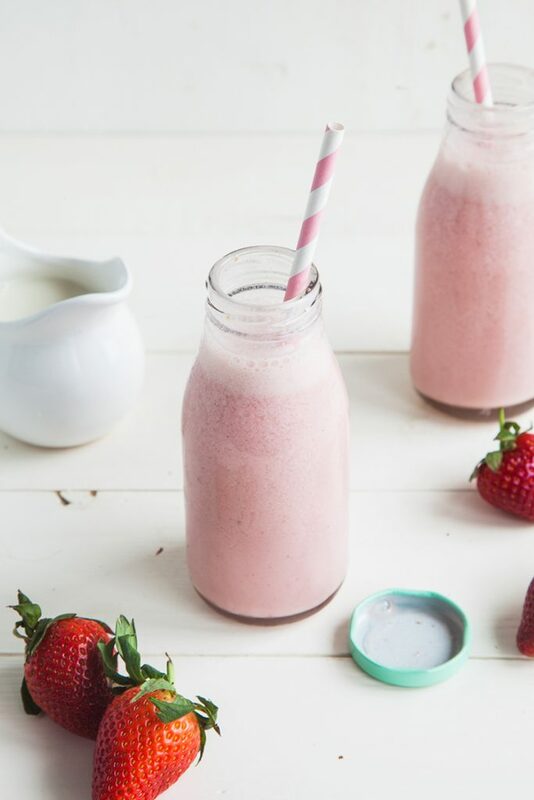 A delicious, healthy smoothie that tastes like strawberry milkshake! Simply blend all the ingredients together in a high-powered blender and pour into 2 glasses or bottles. 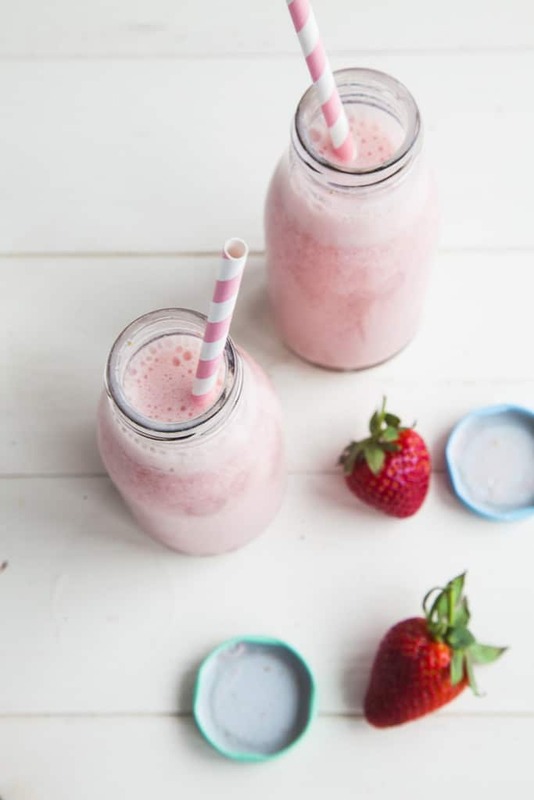 *If you're blender can't process ice, use frozen strawberries instead and add extra almond milk. What’s your favourite kind of smoothie? Do you like them fruity, green or other? Well now I have to try and come up with a strawberry shortcake smoothie! Pink foods are the best! That's what I was going for, Linda :-) Nostalgic healthy remakes are the best! This looks so dreamy n delicious! 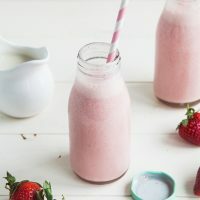 I love strawberry smoothies and this is absolutely yum! This is so pretty! I can't wait for strawberry picking this summer! One of my favourite summer past-times :-) Can't wait for that too! Such simple flavors but SO good! I love love strawberries! My favorite! This is so, so pretty! I love that you included dates, and the strawberries! Thank you for making a banana free version. This looks so beautiful! I need to make this for my boys! They would love it! That looks so pretty, fresh and inviting. I'm tempted. Nice idea adding the dates, it's something I never think of adding. I always add dates now because it gives the smoothie the sweetness it needs but is also nutritious :-) Thanks Jacqueline! Thanks Natalie :-) I always struggle with recipe names! Mmm such a classic delicious flavor! And yay for banana-free!